Abnormal clotting. 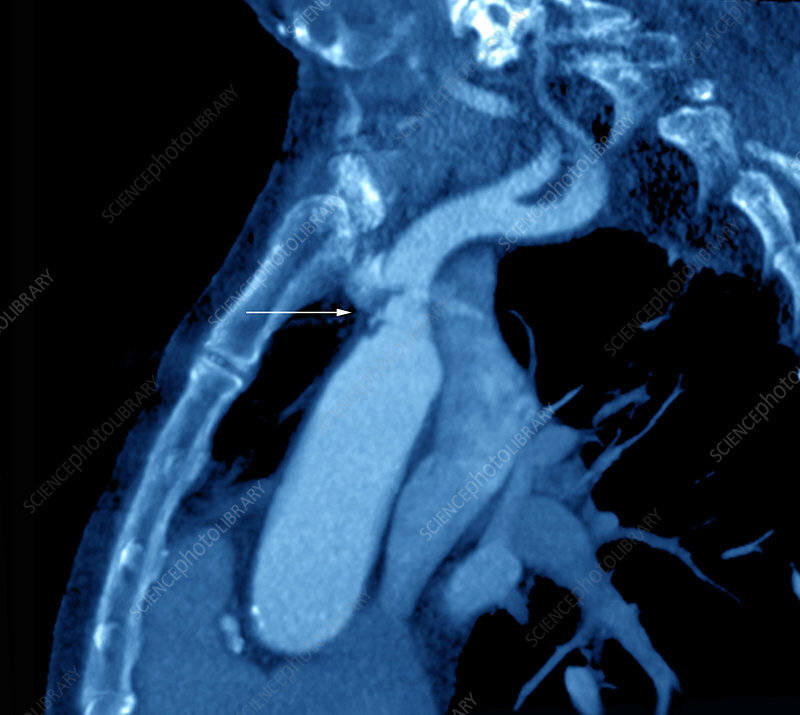 Coloured sagittal computed tomography (CT) scan of the chest blood vessels of a 70-year-old stroke patient with abnormal clotting. The front of the chest is at left in this view from the side. The blood vessels (bright blue) have been highlighted by the injection of iodine, a contrast medium used in CT scans of blood vessels. The clot (arrowed) is the dark area near centre, on the wall of one of the blood vessels. It is an abnormal clot (thrombus) and is at the junction of the aorta (lower frame) and the right sub-clavian artery (upper frame). The patient is being treated with anti-clotting drugs after suffering reduced blood flow (ischaemia) to the brain. If this clot breaks loose and travels to the brain or heart, it could kill the patient.